Moscow and Damascus launched a military operation in the Syrian province of Idlib, bordering with Turkey. They conducted the air strikes in the south and south-east of the province on 8 September, killing nine civilians. Idlib is a stronghold of the diverse Syrian opposition. After the fall of Aleppo, East Guta and the province of Dar'a, a significant part of the opponents of the President Bashar Assad regime moved in Idlib. There is the "Syrian Free Army" - the military wing of the "National Coalition of Syrian Revolutionary and Opposition Forces" of Khaled Khoja. About 30,000 armed Islamic extremists from the terrorist organization Akhrar ash Sham and the Islamic coalition "Hayat Tahrir ash Sham", led by Jebhat an Nusra, the Syrian branch of Al-Qaeda, are present in Idlib. Even before the fighting began, the United States, the EU and the UN expressed concern about the humanitarian disaster - up to 3.5 million people live in Idlib. Since the beginning of September, 26 local residents have died under bombardment. Turkish President Recep Erdogan is also concerned about the situation in Idlib. Last week he stated that he would try to convince the leaders of Russia and Iran not to arrange massive bombardments in Idlib and to separate terrorists from other people. Nobody was able to listen to Erdogan at the summit of the leaders of Russia, Turkey and Iran in Tehran. Russian President Vladimir Putin said that it is unacceptable when, on the pretext of protecting the civilian population, they want to remove terrorists from the attack, as well as damage the Syrian government troops. The Kremlin master talked about provocations being prepared in Idlib, staging the use of chemical weapons by Damascus. His Iranian counterpart Hassan Rouhani called for the withdrawal of US troops from Syrian Kurdistan and the cessation of Israeli air strikes. The military operation in Idlib reveals the differences between Russia and Turkey in spite of attempts to build a military-political alliance with Iran, in contrast to the United States, Israel and Saudi Arabia in the Middle East. The military operation in Idlib can adversely affect the reputation of Erdogan and Turkey in the Muslim world. Since coming to power, Erdogan has contributed to strengthening the influence of Islam in the socio-political life of his country. During the "Arab spring" the Turkish president approached the Islamists, who overthrew secular governments in Egypt, Libya and Tunisia. He advocated the breakthrough of the Israeli sea blockade of the Gaza Strip, which is ruled by the terrorist organization Hamas. Support for moderate Islamist opposition in the civil war in Syria is a puzzle in Erdogan's Middle East policy. The Turkish president seeks to strengthen Turkey's influence in the countries that once were part of the Ottoman Port and decrease the US influence in the region. From the first days of the armed conflict in the neighboring Arab Republic, the Turkish authorities supported the "Syrian Free Army." Erdogan allowed the opposition party "Syrian National Council" of the Communist George Sabrane to establish his headquarters in Ankara. In 2016-2017 years the Turkish armed forces together with the "Syrian Free Army" conducted a military operation "Shield of the Euphrates" and cleared the Syrian Governorate of Aleppo from ISIS and the Kurdish armed formations, turning it into a buffer zone under the administration of the Provisional Government of Syria (the headquarters is located in the Turkish city of Gaziantep ). Erdogan, in the spirit of pan-Turkism, gained the image of the defender of the Syrian Turkomans from the arbitrariness of the regime of Bashar Assad. With the support of Ankara, they founded the opposition "Syrian Turkoman movement" and armed groups "Brigade of Syrian Turkmens", "Jabal at-Turkman Brigade" (linked to the terrorist organizations Al-Qaeda and Jebhat An Nusra), the Sultan's Selim Brigade. The leader of the Syrian opposition Khaled Khoja is a Syrian Turkoman. Turkey was interested in the fact that the scattered Syrian opposition groups "Syrian National Army" from Haleb and "National Liberation Front" from Idlib joined forces and went on the offensive against Assad's troops. The deputy commander of the "Syrian National Army" Ahmad al-Othman assumed that in the case of success in the north of Syria, a combat-capable 100,000-strong military grouping of opposition forces will appear which will be able to take control of the whole province of Aleppo. However, the Russian-Turkish offensive against Idlib puts Turkey's plans in Syria under attack. The air and space forces of Russia and Assad's troops will simply extinguish the armed formations of the Syrian opposition in the course of the battles for Idlib. 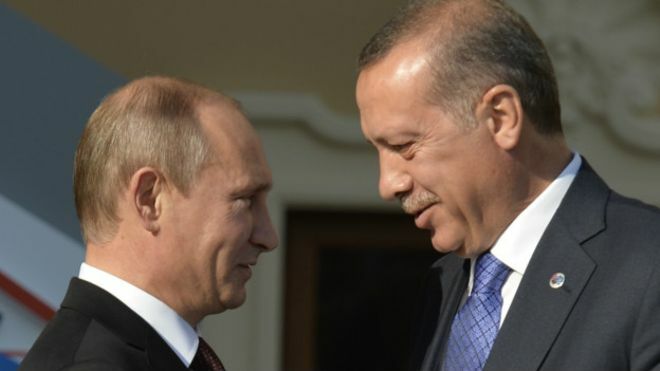 It is unlikely that Erdogan will give military assistance to his satellites in Idlib, in view of the fact that the aggravation of relations with Russia is unprofitable for Turkey. Ankara establishes military technical cooperation with Moscow, participates in the implementation of the "Turkish Stream" Russian gas pipeline. And the Muslim world simply does not understand the inactivity of Turkey. The current situation looks as if Erdogan decided to surrender his "people" in Idlib to be eaten by the "infidels" in the person of Russia and the Assad regime for political and economic interests. The military operation in Idlib demonstrates Turkey's weakness, inability to defend its interests in Syria and to agree with Russia and Iran on maintaining the status quo for territories controlled by the Syrian opposition. Negative is added by the fact that after capturing Idlib, Assad's troops free themselves a path for a campaign to the north of Syria, which is now in the sphere of Turkish influence. In May, Assad stated that government forces would conquer territories if they could not agree with the Syrian opposition. The threat of influx of new refugees from Idlib to Turkey adds fuel to the fire. And Turkey is familiar with the migration crisis not by hearsay. Turkish cities have turned into a passing yard for hundreds of thousands of Syrian refugees on their way to the European Union. Since 2016, Turkey has 3 million refugees on its territory under agreements with the EU. According to the forecasts of the United Nations, as a result of the offensive in Idlib, no less than 800 thousand inhabitants will remain without a roof over their heads. The military operation in Idlib casts doubt on Turkey's ability to play the role of a self-sufficient center of power in the Middle East. Russia is not going to take into account Turkey's interests in Idlib and to interrupt the military operation. The global goal of Moscow and Tehran's interference in the Syrian conflict is to keep Assad in the president's chair. The Assad regime seeks to regain control over all regions of Syria with military support from Russia. Idlib is another goal. While conducting military operation in Idlib, Russia tries to work out the image of a fighter against terrorism and Islamic extremism in the eyes of the West, to distract the attention of the international community from the ongoing aggression in Ukraine. Dual position on Idlib is followed in America and Europe. In the West, the use of chemical weapons by the troops of Assad, large civilian casualties are unacceptable, but none of the politicians or military appealed to Russia and the Assad regime to not conduct a military operation in Idlib. German Chancellor Angela Merkel, commenting on the events in Idlib, stressed that it is necessary to try to overcome the radicals, but at the same time protect the civilian population. US President Donald Trump warned Putin and Assad from reckless actions. The Chairman of the US Joint Chiefs of Staff, General Joseph Dunford, stated that the military operation in Idlib should be narrowly focused in order to avoid a humanitarian catastrophe. The fact is that Ahrar ash Sham and Hayat Tahrir ash Sham, which are concentrated in Idlib, are perceived in the West as a threat to international security, and Russia and the Assad regime - as a lesser evil, capable of destroying them. The Jebhat an Nusra group is responsible for ethnic cleansing of Shiites and Alawites, mockery of captives from government forces and is recognized as a terrorist organization in Russia, the United States, Australia, the United Kingdom and the United Nations. The United States conduct air strikes in Syria both on the positions of ISIS and on the positions of Jebhat an Nusra. This organization stands for the establishment of an Islamic state after the overthrow of the Assad regime in Syria. The "Syrian Free Army" also raises doubts in the West, as it interacted with Jebhat An Nusra during the defense of Aleppo in 2016 and called on the US to exclude it from the list of terrorist organizations for fighting against the Assad regime. Many Islamic extremists and mercenaries from various Middle Eastern countries are fighting in the ranks of the "Syrian Free Army". In this regard, in 2017-2018 the United States, France and the United Kingdom have ceased to give financial and military assistance to this organization, and now they treated it as a bargaining chip. The West is satisfied that Russia is doing all the dirty work in Syria, and the Assad regime is perceived as a lesser evil than "Jebhat an Nusra." Moscow and Damascus enjoy the passivity of Washington and Brussels and establish their control over the territories of the Syrian opposition under the pretext of combating Islamic extremism. Washington has already showed to Moscow and Damascus its "red line" in Syria, which cannot be crossed. The United States will use force in Idlib in the event that Assad's troops use chemical weapons against their opponents. US State Department spokesman Heather Nauert warned Russia and the Assad regime against the use of chemical weapons before the start of the operation and otherwise promised an operative and adequate response from the US. For the United States, it is undesirable that the next goal of Putin and Assad might be the Syrian Kurdistan, controlled by the "Syrian democratic forces" sponsored by the Americans. Self-proclaimed by the Syrian Kurds, the independent territory of Rozhava is the mainstay of American influence in Syria, several thousand US military are deployed there. If Russia and Assad's troops cross the "red line" outlined by Trump, the Pentagon will once again launch rocket and bomb strikes against their positions. This happened the last year, when the US military bombed the military airfield of Khairat, and in April this year, when industrial objects and warehouses in the Damascus area were attacked by the United States and France in response to Syrian military chemical weapons. In February 2018, the US military destroyed a detachment of Russian mercenaries from the Wagner PMC trying to occupy the oil fields in Deir ez Zor province, which are controlled by the Kurds. The United States has already been prepared and sent a destroyer and a submarine with Tomahawk cruise missiles to the Mediterranean, deployed a strategic B-1B missile with air-to-surface missiles at the El Udeid airbase in Qatar, in order to set fire to Assad's troops if necessary. It is unlikely that Trump will use military force in Idlib for the sake of defending the Syrian opposition. It's not just that the United States, France and the United Kingdom have forgotten the "Syrian Free Army." The problem is in Erdogan, who went to a political confrontation with the West. The US is not satisfied with the fact that Turkey has begun rapprochement with Russia and Iran, and also ignores American interests in the Middle East. Erdogan's purchase of S-300 complexes in Russia, which do not comply with NATO standards, the desire to close the American airbase Incirlik and the refusal to release the political prisoner, American pastor Andrew Brunson, whom Ankara suspects of spying and links with the oppositional theologian Fethullah Gulen, was the last straw for the USA's patience. Such behavior is not appropriate for the US military-political partner, so the White House is washing its hands of the situation in Idlib. The United States leaves Turkey's Syrian partners one-on-one with a superior opponent. » Syria: Who's in control of Idlib?